Blogging goals and one for ME! Yes, I am jumping on the resolution band wagon, and for all of the cliche reasons! It's a new year, a new attitude, and a new day! If this doesn't make you feel ready to kick start some changes, I don't know what does! So I'm linking up with a few of my BBBs to share with you where this blog will be headed in the new year! BLOG MORE! : When I first started this blog a little over a year ago, I found time to fit it in my busy schedule whenever I could. Blogging became my place to share, vent, show, collaborate, and learn. I want to get back to the routine of blogging at least 3 times a week, and having MEANINGFUL posts. As much as I love creating for TPT and sharing my products, I don't just want this to be a place of promotion. I want to blog more to share more, not to promote. Share often: I can't tell you how many ideas I've gotten from other teacher's blogs that truly work in the classroom. Nothing brings a bigger smile to my face then reading comments from other teachers that have used my ideas. I want to share what works and what doesn't work, so we all can teach and learn! SHOW it in action: I don't just create random products for my TPT store. They are tried and true activities that have worked in my own classroom and my students love and learn from. I want to show my products in action more, instead of just promoting them. There's nothing better then seeing students work hard on a task that you can get for your own room! There you have it! Keep following in this New Year to see all of these things from this lil ol' blog of mine! 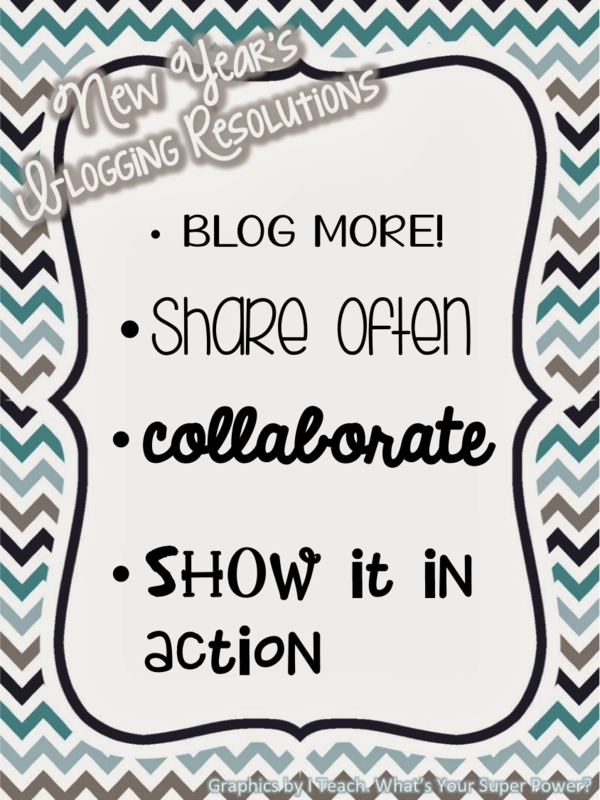 And head on over and link up with one of those amazing bloggers I was talking about, Diane, to share your resolutions! Another one of my inspirations since the beginning of my blogging days is Tara at Fourth Grade Frolics! 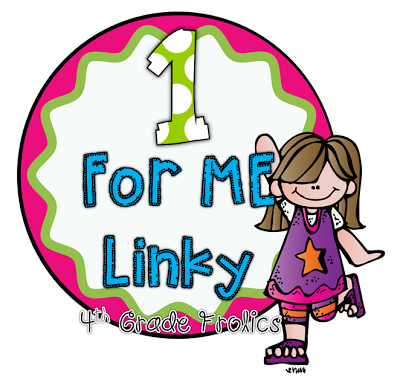 Her ME linky party couldn't have better timing, it is JUST what I need right now! So here's a little soul searching for you all. Let's get DEEP! I am known at my school as a ball of energy, the energizer bunny, always smiling, always bubbly, and never stopping. I have been this way my whole life and I love being the positive, glass half full, optimistic one! But a few months ago something changed. The new teacher evaluations from our state came down and the stress started piling up. My masters course work continued to grow and volleyball season was no where near ending as I spent every night in a gym. I was told that even though I'd been teaching for 4 years and graduated BEFORE a new mentor program was implemented that I still had to complete mentor/teacher tasks (mind you, the state admitted I could basically sue because they screwed up my license, but we won't get into that debacle) Mind you, this last year of tasks is about 70-80 hours of work that includes 5 tasks with video taping hour long lessons, voice over commentating, writing research reports and research based lesson plans, and a wholeeee lotta other things! And the energy, smiles, and bubbliness (yes, it that is now a word!) slowly started to dwindle. Tack that on to a few personal problems, and you have one grumpy, sad, teacher. So as break started to draw nearer I began to reflect and analyze where I saw myself heading. I realized I didn't like me. I don't like being negative, sad, upset, crying, or pessimistic about anything. And I certainly was being those things. I leaned on my husband to help support me, and he was a champ. I took 2 weeks of some serious relaxation, time away from teaching, blogging, grading, planning, evaluation, data, and everything else that caused me stress. Now, I'm not going to tell you that "VOILA!" things are all better. But we're getting there, people! I am back to my bubbly and cheery self. I'm finding time to workout and eating healthier, and I am taking my stress load one day at a time. When school starts up I know it will be tough, but I've made it this far, and I'm only looking forward! So what is my 1 for me goal? REMEMBER who I am! I want to be the same positive, fun-loving, energetic gal I've always been. And I know with hard-work, focus, and keeping the end result in mind that I can continue to be that. I have a great support group around me (special shout out and thanks to my hubs!) and I know it's possible. I hope you're all with me when I say it's time to make time for US! As teachers we are constantly worried about others. Wiping their tears, hugging them, holding them, caring for them. And I plan to continue to do this, but I plan to care for myself, too! My sweet friend! Awesome post but it makes me sad you were hurting the way you were. It really stinks when we let the stresses of life rob us of our joy, so much so that it changes us as people. That has happened to me too....I think this year especially. We have got to take care of us and then I know everything else will fall into place. Thanks for linking up and you have my email and KNOW I am just a shout away if you ever need to vent, cry, scream.....whatever you need! Happy New Year friend:) We will get through this supporting and encouraging each other:) <3 Hugs!!! Hi my dear blogging buddy! I am so sorry for the stress that you have been under - and can totally relate to the feeling that the seemingly endless requirements of teaching can steal the joy you initially felt. I am both encouraged and challenged by your post - to prioritize, work efficiently, and give myself permission to take a break! Thank-you for sharing from your heart. Hi BBB! Thank you so much for your sweet comment. It's people like you that remind me why I do love my job and that it is rewarding! Thank you for being you and giving me a little pick me up :) I hope we are able to find balance in this new year! Thanks for the love! I'm sending virtual hugs your way! I think that we've all been there at one point or another. I'm so glad that you're on your way back to being yourself, but just know that we're here for you when you need us! This makes me so sad to read because I know that you are no alone in this. I truly don't believe that states, lawmakers, etc. even realize the pressure they are putting on us with these evaluations and everything else they have added. It's so disheartening. I am glad that you were able to take some time for yourself and put everything else aside! Thank you so much for your sweet words, Alison. I know I am definitely not alone in this and just need to keep reminding me that we're all in this together! It certainly is disheartening, I just keep trying to remember WHY I love teaching :) Have a happy new year! Thank you so much for this honest post, sweet friend. I am so sorry to hear that your joy was dampened for a while. I would imagine so few legislators and administrators realize how much their decisions impact our daily lives and attitudes. Your word "remember" is so perfect. I am so glad this break you have been able to reclaim your joy. Thank you so much for your sweet comments. They are just what I need right now :) Your love and support means SO much to me! I don't think they even think about the impact their making sometimes... very sad! I am definitely working on remembering! :) Thanks for the love! I am so sorry to hear about all that stress and pain. It breaks my heart to see wonderful teachers like yourself suffering because of the decisions, (and in your case even mistakes!) of others. I am glad you had some time relax and refocus. In such a stressful environment as many schools today are, it can be hard to find the joy. Just remember why you started teaching and do the best you can! Awe, I'm so glad your back to your bubbly and cheery self!! I am the same way, always happy and cheery, but I can definitely get stressed out with so many things going on (and going to school in addition to teaching is no easy task)!! So glad that you have been able to rest up and relax these past couple weeks!! You are an amazing person and teacher and I'm sure your coworkers and students all appreciate your energy and positivity!!! I'm so sorry to hear that you've been going through this. Thank you for sharing your personal journey. It's not easy to share what we really feel, but I think it helps us process and it lets other (like myself) no that we aren't the only ones feeling bogged down with the ins and outs of teaching. I hate that you've had other expectations thrown your way too. Sometimes it takes a break to remind us who we really are! Wishing you much happiness in 2014! Your story is one that I could have written. When I started teaching 10 years ago I had so much energy and excitement. The high stakes testing and evaluations, combined, in my instance with a less than supportive administration, has made teaching hard. That's why I want and need to blog. I want to connect with others who share the same desires as me in the same daily grind. Here's to a great 2014 for all of us educators!